Petioles scattered along creeping stems, 0.3--3.5 m, shallowly to deeply grooved adaxially, base not strongly distinct from stem. Blades broadly deltate, papery to leathery, sparsely to densely hairy abaxially, rarely glabrous. Pinnae often opposite to subopposite [alternate]; proximal pinnae often prolonged basiscopically, each proximal pinna nearly equal to distal part of leaf in size and dissection (except in var. caudata ). Segments alternate, numerous. 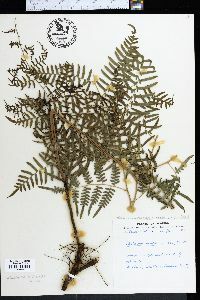 In accord with the most recent revision (R. M. Tryon 1941) of the genus, Pteridium is treated here as a single widespread species composed of two subspecies with 12 varieties. So treated, it is probably the most widespread species of all vascular plants, with the exception of a few annual weeds (F. H. Perring and B. G. Gardner 1976). The plants are generally aggressive, invading disturbed areas as weeds in pastures, cultivated fields, and roadsides. In Europe, it was harvested and burned to produce potash. Although croziers are eaten in many temperate cultures, bracken has been shown to contain thiaminase (and other compounds with mutagenic and carcinogenic properties). Disagreement exists among taxonomists regarding the rank that should be accorded to the taxa treated herein as varieties. In a survey of the genus, C. N. Page (1976) noted uniform chromosome numbers and flavonoid compositions of the varieties. D. B. Lellinger (1985) separated the genus into at least two species based on morphology, recognizing as species the subspecies of R. M. Tryon (1941). J. T. Mickel and J. M. Beitel (1988) reported sympatric occurrence in Mexico of three taxa that maintained consistent characteristics and only rarely produced plants with combined characteristics. They suggested that these three taxa should be considered as species that occasionally hybridize. P. J. Brownsey (1989) reported that two different brackens in Australia formed sterile hybrids and should be treated as species. Modern systematic studies are needed to evaluate the status and rank of the four North American varieties. As treated below, Pteridium aquilinum var. pubescens , var. latiusculum , and var. pseudocaudatum are in subsp. aquilinum , and var. caudatum is in subsp. caudatum (Linnaeus) Bonaparte. LEAVES: widely spaced along the rhizome, 0.4-3.5 m long. PETIOLES: straw-colored, hairy at least proximally. RACHISES: similar to petioles, straw colored to green, glabrous or hairy. BLADES: 15-100 cm wide, broadly deltate, mostly 3-pinnate-pinnatifid, with usually 14 or fewer main lateral pinnae, these often opposite or nearly so along the rachis, the basal few pairs of pinnae longer basiscopically than acroscopically PINNAE: 7-50 cm long, mostly 2-5 times as long as wide, the pinnules with numerous deep lobes, sparsely to densely hairy, at least abaxially (Fig. 2A). LOBES: with the margins entire or inconspicuously crenulate. PSEUDOINDUSIA: differentiated from the rest of the blade, pale or whitened, glabrous or hairy. SPORES: 25-40 μm long, the surface finely granulate, dark brown. 2n = 104. NOTES: Nearly worldwide. Bracken is found on every continent except Antarctica and generally is considered one of the world’s worst weeds, which render range land unsuitable for grazing. Toxins contained in the leaves inhibit the growth of other plant species, and the species has been shown to interfere with the regeneration of trees and shrubs following fires or logging in the western United States. Although the developing fiddleheads have been harvested for human consumption, the leaves also contain a number of nerve toxins, as well as carcinogenic and mutagenic compounds, that are poisonous to both livestock and humans when ingested. REFERENCES: G.Yatskievych and M.D. Windham , 2008, Vascular Plants of Arizona: Dennstaedtiaceae. CANOTIA 4 (2): 38-40.